A natural connection to the land and a love for animals led Christian Francis to the Faculty of Agriculture and on the right path for him. 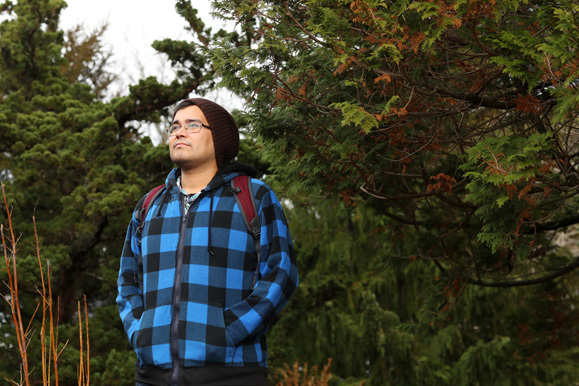 Christian is a member of the Mi’kmaq First Nation from Pictou Landing in Nova Scotia and is enrolled as a third-year Environmental Sciences student on the Agricultural campus. Christian was recently acknowledged on a national scale for his commitment to the revitalized forest products industry and to the Aboriginal community. But it hasn’t always been an easy path. “I've always had an interest in nature, but it took me a few years to get into it academically,” he explains. Originally Christian studied on the Halifax campus and then completed a two-year Audio Engineering program in Halifax, but decided the music industry wasn't what he was looking for. “After that was done I was still trying to find my path,” he adds. Things really came together for Christian a few years ago when he started to work with the environment. “It was rewarding to know that the work I was doing would be helping create habitat for animals, or providing data for conservation biologists, or trying to get Aboriginal youth involved in science and the environment,” he explains. 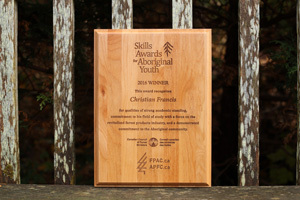 Christian was recently recognized by The Forest Products Association of Canada in partnership with the Canadian Council of Forest Ministers with a Skills Award for Aboriginal Youth. Christian was one of two youth honoured November 22 in Ottawa, Ontario with an award that honours individuals that exemplify the qualities of strong academic standing, commitment to the revitalized forest products industry and a demonstrated commitment to the Aboriginal community. The award was brought to Christian’s attention by a community friend late last summer while he was working for the summer with a not-for-profit organization based out of Millbrook, called the Mi'kmaq Conservation Group, in their new Aboriginal forestry program. “The award is very meaningful to me,” explains Christian. “I see it as a sort of confirmation that I am doing good work. "I am hopeful that my valuing of education and my developing experience with the forestry and land management industry will enable me to someday find and create opportunities for economic growth in my home community," he adds. "Someday I hope to do my part in helping First Nations people as a whole." Christian also acknowledges the importance of recent events on campus, such as the permanent installation of the Mi’kmaq Grand Council Flag on the Agricultural Campus and the renaming of River Road to Sipu Awti – the literal Mi’kmaq translation. “The flying of our flag and renaming of River Road are a great way to acknowledge the shared history and relationship between the campus and the Mi'kmaq people who lived here,” explains Christian. Events like these are an excellent way for Aboriginal youth to experience the campus atmosphere and also for the students and faculty on campus to experience Aboriginal culture firsthand.